Photo (Author Files): This bank was robbed several times over the years. While all bank robberies have the potential for violence, the robbery in this story had a particularly tragic outcome for an ordinary family. The recent story of the young Calgary woman, a University Student Union President, made National headlines that thrust her into a certain kind of notoriety. Living a secret life, she is alleged to have committed several frauds as well as at least one bank robbery, the one for which she was recently arrested. At one time during the 1970s and early 1980s, Oak Bay might easily have been tagged with the dubious distinction of being the Bank Robbery capital of the British Columbia, if not all of Canada. With a population of barely 15,000, there were several banks along Oak Bay Avenue and a lone bank on Estevan Avenue, banks that acted like catnip to robbers. Each bank was hit at least once and a few, more than once. For staid old Oak Bay, it was big news as bank robberies were still considered to be the most flamboyant and, at times, the most glamorous of crimes. In the Oak Bay case it was not a druggy looking for his next fix, nor was it a career robber such as Danny Cain or Stephen Reid, who gained notoriety for daring escapades around Greater Victoria and the Lower Mainland. Both Cain and Reid became rather famous not only for their robberies, but also for the lifestyle they led between robberies. For his part, Danny always used a sawed-off shotgun when he burst into a bank, jumped on the counter, (perhaps firing a shot into the ceiling) and then held the bank staff and customers at bay while a colleague or two collected the loot. One of his most famous daring robberies occurred on Shelbourne Street- and was one of his last. At one time, while in custody, Danny escaped and was cornered on a ledge of the police station (I cannot find any details on the web). I am sure many retired Vic PD will remember the case or may have been directly involved. On the other hand, Stephen Reid, who wrote a National Best Seller, Jackrabbit Parole, while serving time, was known both for his flamboyant robberies (known as being pulled by the Stop Watch Gang) as for escapades after the robberies. After one robbery, there was a protracted pursuit into James Bay as shots were fired and hostages taken. In another case, Reid convinced the Judge to let him out on bail. 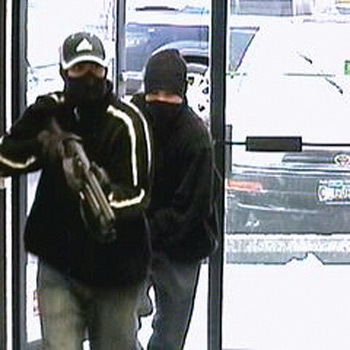 Neither of these men were known to rob banks in Oak Bay. (Perhaps that is fitting as we would expect Oak Bay robbers to act in a much more civilized fashion than those who plied their trade in Victoria, Saanich or Esquimalt.) It was also fitting that when a robber dared to venture behind the Tweed Curtain to knock off a bank, it would be Oak Bay Police officers, with the help of ever-alert bank staff, who would solve the case. In the present case, shortly after the early morning opening, a well dressed, male bandit entered the Bank of Nova Scotia, approached the teller and handed her a neatly written note ordering her to clean out her cash drawer and hand it over. Other than wearing a balaclava pulled over his head, the man could have been a businessman having just walked in off the street. He told the teller he had a gun and warned her not to sound the alarm. As was bank protocol for such events, the teller followed the robber’s instructions to a tee. Interestingly, bank robbers seldom, if ever, obtained more than $1500; often less, in a single heist, as tellers only had access to a limited amount of cash. It would take a sustained effort, a good deal of planning and daring, to pull off a heist that would net more than $5000. That was not much money for what is considered to be a violent crime that usually involved weapons and threats of death and could land the perpetrator in jail for one or two decades. Following the robbery, Oak Bay officers, under the direction of Detective Campbell, attended the bank, obtained a vague description of a masked suspect, completed the usual identification work and circulated details to all cars and departments (ACAD’s). 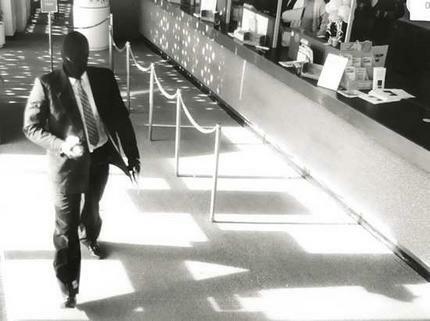 Bank staff noted the robber to be well dressed, almost professional looking, a man who spoke in a quiet almost in a gentlemanly way as he warned the teller to comply. Cartoon: It is interesting that Bank Robbers have always been pursued with such tenacity while Bank Barons get a bonus for doing the same thing from the inside. See comments in footer. While there was a regional plan in place for dealing with such calls, most robbers usually disappeared within minutes, holed up and waited until the heat dissipated. In this robbery, as was the protocol for all Oak Bay banks, a number of marked bills (serial numbers recorded) were included in each teller’s cash draw. In the robbery, all the marked bills were to be handed over with the stolen cash. As soon as possible following the incident, bank staff were to fan-out the numbers of those bills to all other banks in Greater Victoria. Although the system was set up such that every bank was sent the numbers of the stolen bills, it still required that each staff member be given the list and that they take the time to scan incoming money. For several reasons, the marked money could easily pass by unnoticed. Nothing further developed until mid- afternoon that same day when a call was received from a downtown main branch bank advising that several of the marked bills had been deposited in one of their external cash deposit machines. 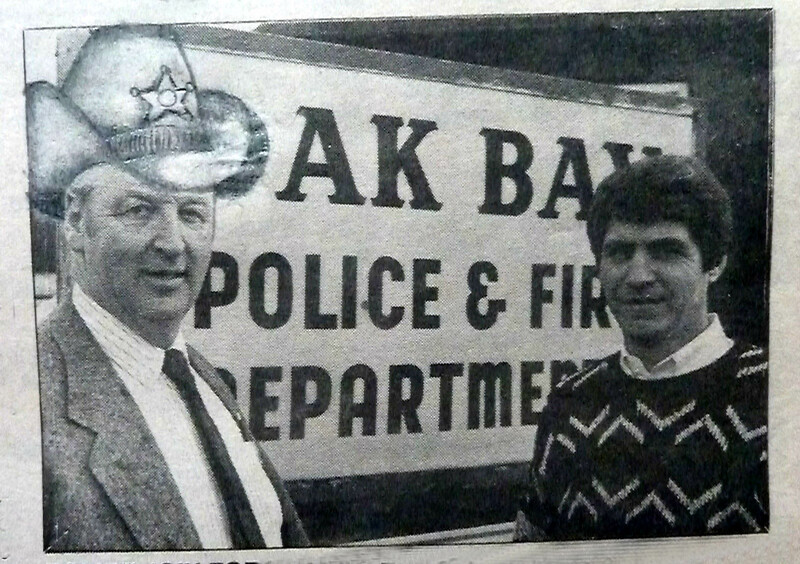 Photo, Oak Bay Star Weekly News: Oak Bay’s ‘Star’ Detective, Sergeant Al Campbell (left), stands with FBI Agent, Bob Hanis from South Bend, Indiana, in a lead to a story about apprehending an International Fugitive listed on the FBI’s Most Wanted List. The story of the capture was posted in International Pursuit of a Felon (Link Here). Bingo! Not more than four or five hours after the robbery, an amount of money, roughly equal to that taken in the robbery, had been deposited to the personal account of an individual who dealt regularly with one of the branches of that particular bank. While that was not conclusive proof the person was the robber, it was certainly a good lead. The investigation then went into overdrive. A name and address was soon obtained and under the direction of Detective Campbell, a team of Oak Bay officers as well as the SWAT team from Saanich, was assembled as the robber was believed to be armed and dangerous, Given the MO and description of the man, it seemed likely he was responsible for several other robberies in the Greater Victoria area. Through surveillance, it was established a car registered in the name of the suspect, was parked in the driveway of an upscale Saanich home. After the SWAT team and other officers were in place, Detective Campbell, who was also one of Oak Bay’s hostage negotiators, phoned the residence and spoke to the homeowner. The man was advised of the nature of the call and told that his house was surrounded. It did not take Campbell long to establish the man was in fact the bank robber. A standoff ensued. Conversation extended for a considerable time but the suspect stated he would not come out and eventually hung up on Campbell. As time passed and no further contact could be made, it was decided SWAT team members would effect an entry. First they tried to contact the man using a loud hailer and then by knocking at the door. When no response was received and after exhausting all options, the decision was made to enter. Once inside, team members found the suspect locked in the bathroom. He had committed suicide. Follow-up investigation revealed the man, a professional by training and career, had fallen on hard times when his business began to falter and his financial world was collapsing. By various investigative means it was established he had been responsible for several other bank robberies in the Greater Victoria area over a two month period. While it was great to catch the robber, it was a sad ending to a life that at one point had likely held such promise. 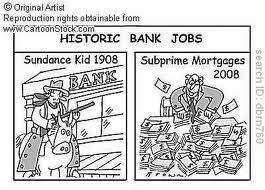 It has always struck me as strange that street level, run of the mill bank robbers, are jumped on with the full force of the law whereas, back room bank robbers, such as those that regularly pop up along Wall Street and other centres around the world, are given a free pass. Why is that? The bank robbers I met were just ordinary citizens. Some were drug addicts looking for the next fix (e.g. Stephen Reid), while others chose it as a preferred life style rather than living what they might consider a humdrum life (e.g. Danny Cain). Both men were bigger than life. It is probable you could find several police officers who would have been happy to speak on their behalf, yet both men were locked away decades because they openly declared their chosen career was robbing banks and they did so with panache. It is my belief these men, and many more like them were much more honest than the hundreds of men (mostly men) along Wall Street who cheated, lied and defrauded hundreds of thousands of people out of their life savings and homes and, along the way gutted the US and many other economies around the world. Many in big business do the same. All this was (is) done to enrich themselves and their families while pretending to be honest, upstanding citizens. Other than a couple of notable cases, how many of these men ever ended up in jail? How is it we as a society permit this to happen when it is within the power of our government and judicial system to bring these criminals to justice? I am not suggesting we should let run of the mill bank robbers go free, just that we should ensure tha other robbers are regularly detained in the same penitentiaries. If you have a plausible explanation as to why one type of bank robbery is allowed and the other not, I would be pleased to hear your comments. Unchecked Wall Street Robbers… My personal experience has shown me a couple of things. One, is that society cannot afford to be seen to the tolerate even the propensity for violence, which underpins the high majority of Bank Robberies. Second, White Collar Crime is commonly seen by society as a victimless crime. The facts remain, that the lies, manipulations and broken trust to defraud and steal enormous amounts of money, actually can clean out family life savings, ruin a company and destroy hard and honest working investor. And the proof is in the pudding, they say… no White Collar Criminal was ever seen during any of the extentended engagements of nearly twenty five years I spent with the federal government. Some fourteen years after my imprisonment and being entrenched in the gangster lifestyle, my wife and family, my own successful small local business, and Full Pardon has shown me that that nothing, and I mean nothing is more important than family, friends, community and living a law abiding life. Somethings never seem to change mind you. Take for example, a researched factual article that is supportive of a true story versus countless slanted and inaccurate versions of the facts written as dramatizations meant to influence the uninformed and to sell papers, to say the least! Unchecked Wall Street Robbers… My personal experience has sn howme a couple of things. One, is that society cannot afford to be seen to the tolerate even the propensity for violence, which underpins the high majority of Bank Robberies. Second, White Collar Crime is commonly seen by society as a victimless crime. The facts remain, that the lies, manipulations and broken trust to defraud and steal enormous amounts of money, actually can clean out family life savings, ruin a company and destroy a hard and honest working investor. Proof is in the pudding, they say… no White Collar Criminal was ever seen during any of the extentended engagements of nearly twenty five years I spent with the federal government. Somethings never seem to change mind you. Take for example, a researched factual article that is supportive of a true story versus countless slanted and inaccurate versions of the facts written as dramatizations meant to influence the uninformed and sell news papers, etc., to say the least!